We have a lot of evidence that ExtendBars can help control nighttime hypoglycemia or dangerously low blood glucose. For those of us who use insulin or one of the sulfonylurea pills, ExtendBars are quite valuable. I don’t use any medicine that can cause hypoglycemia, so until now I hadn’t used ExtendBars. But my blood glucose level is usually higher in the morning than when I go to bed, the so-called dawn phenomenon. This is a normal process of our hormones, which raise our blood glucose levels before we wake up. These hormones work against the action of the insulin in our bodies to stimulate the release of glucose from our livers and inhibit our use of glucose. This ensures a supply of fuel in anticipation of body’s needs when we are awake. The problem is that our livers continue to make new glucose even when it’s not needed. My liver certainly makes more than enough glucose to get me started each day. That’s why I was excited to read a study of 28 adults with type 2 diabetes by Maryellen Dyer-Parziale of Casa Pacifica Medical Clinic in Camarillo, California. Her study, published in Diabetes Research and Clinical Practice, showed that her test subjects had a 28 percent reduction in morning hypoglycemia compared with those taking a placebo. She writes that the subjects using the ExtendBar averaged a mean blood glucose level of 114.2 mg/dl, and those using a placebo averaged 158.49 mg/dl. The difference is 44.29 mg/ml. Dividing that by 158.49 mg/dl percent equals 27.9 percent. I just had to try this for myself, particularly after ExtendBar President Vijay Chauhan sent me a dozen low-carb and low glycemic ExtendBars. These new ExtendBars come in three flavors, peanut, apple cinnamon, and chocolate. The peanut bar was to my taste by far the best. Another company, Valeant Pharmaceuticals International, makes something similar called the NiteBite. Years ago I tried them, but I didn't liked the taste. Immediately after receiving the complementary ExtendBars, I put them to the test on the usual guinea pig — myself. My study was not a randomized double-blind, placebo-controlled trial of a medical treatment, the gold standard of clinical trials. See http://www.mendosa.com/bratman.htm. But neither was the Dyer-Parziale study, in which the experimenters were not blinded. Her study included 28 people — no comparison to mine — but still not enough to meet the standards of statistical accuracy. I followed my regular diet and took an ExtendBar on alternative nights just before going to bed and then tested immediately after getting up in the morning. I fully expected that the ExtendBar nights would prevent or reduce my usual dawn phenomenon. There are several ways of looking at the results. The best is probably a comparison of the median levels of the 12 nights after taking an ExtendBar and the 12 nights I didn’t. My median level with an ExtendBar was 162 mg/dl. Without, it was 153. The average was a bit closer: 161 for an ExtendBar and 155 without. Just to be sure, I also compared the differences between my level just before bed with my morning level. The average increase was 35 points for those nights I used an ExtendBar, but just 10 points for those nights I didn’t. The median was a little closer, 30 points for the ExtendBar and 14 points without. Every way you look at it I did better without an ExtendBar. And every night that I took an ExtendBar my morning level was higher than when I went to bed. But on three of the 12 nights I didn’t take one my level was lower in the morning. I can’t explain why the Dyer-Parziale study showed a mean (average) decrease of 28 percent for those times the test subjects ate an ExtendBar, while I averaged a 4 percent increase (the difference is 6 mg/ml and dividing that by 161 mg/dl percent equals 3.7 percent). But we were testing different ExtendBars. The Dyer-Parziale study used ExtendBars that had 30 grams of total carbohydrate, including 5 grams of uncooked cornstarch, which our bodies absorb slowly over a period of 6 to 9 hours. The new low-carb formula in my test has 19 to 21 grams of total carbohydrates, of which 5 are uncooked cornstarch, 5 are fiber, and 6 are maltitol, a sugar alcohol. Another difference is that the subjects of the Dyer-Parziale study had a mean A1C of 8.21 percent — poor control — while my most recent test was 6.4 percent — considered good control. A third difference was that the Dyer-Parziale study compared ExtendBars and a placebo for three evenings each, while I compared an ExtendBar and my normal diet for 12 evenings each. The results surprised me. But “how could eating something bring down your blood glucose level?” someone asks. Good question. This article originally appeared on Mendosa.com on April 9, 2005. 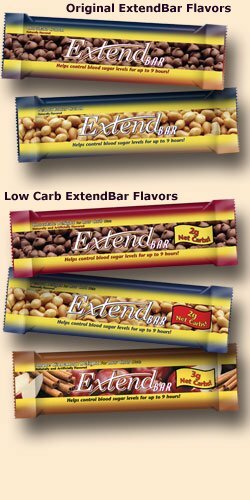 ExtendBar’s website is http://www.extendbarworks.com/.